In a nod to the legacy of Modernism, Jeff Krueger uses recurring, abstract forms. But his ceramic works and drawings do not maintain the primacy of the non-contingent art object. 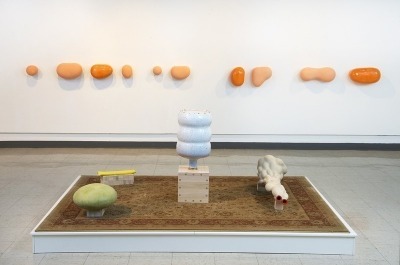 Whether in sculptures glazed with his own blood or objects that evoke both physics and philosophy--his works refer to real objects and issues in our very messy lives. Dorielle is one of ten finalists in the running for the $50,000 Bennett Prize for Women Figurative Realist Painters. 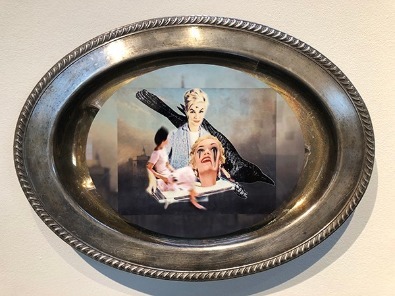 "A four-member jury, which includes renowned realist painters Maria Tomasula and Andrea Kowch, selected the finalists, who will receive $1,000 to participate in the exhibition. The winner of The Bennett Prize will receive $25,000 annually for two years to allow her to devote the time necessary to mount a solo exhibition of figurative realist paintings, which will open at the Muskegon Museum of Art in 2021 and then travel the country. "The Bennett Prize spotlights women artists who are or seek to become full-time painters, but have not yet reached full professional recognition. The Prize is also designed to allow the public to learn more about the creative vision of talented women painters working in the increasingly popular style of figurative realism." 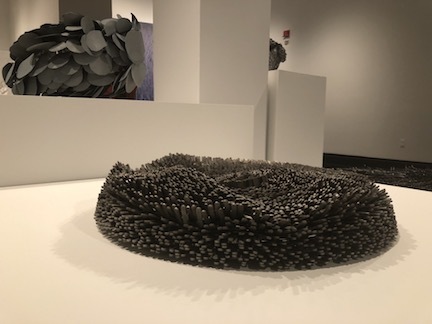 washers, hand cut & twisted wire 15"x18"11"
welded steel, automotive paint 17"x18"x11"
individually welded steel byproduct 3"x27"x27"
Paula Castillo gives an artist talk at The National Museum of Women in the Arts on her background and inspiration. "My interest in working with metal began early, because I grew up in a family that used and valued the detritus of the world. 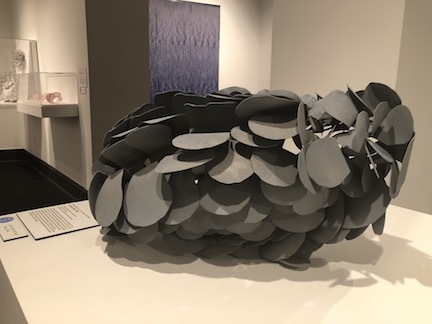 The idea of working with metal was always accessible to me: my Lebanese family had been blacksmiths before they came to the United States while my Hispanic family, including my father, were welders. My work engages in the practice of understanding how forces and systems - both the human-made and the natural - are perpetually remaking the world we inhabit. I create welded sculpture using industrial steel byproducts scavenged from regional waste streams. My process is a high-tech/low-tech hybrid. 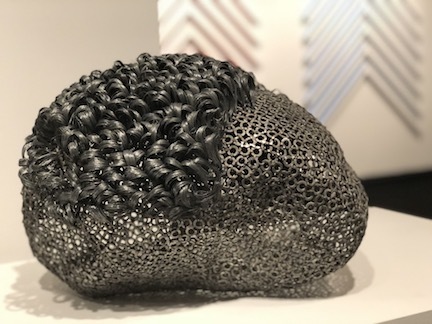 I begin by designing forms with 3-D development software, then I create those forms by hand-welding thousands of discarded industrial byproducts."